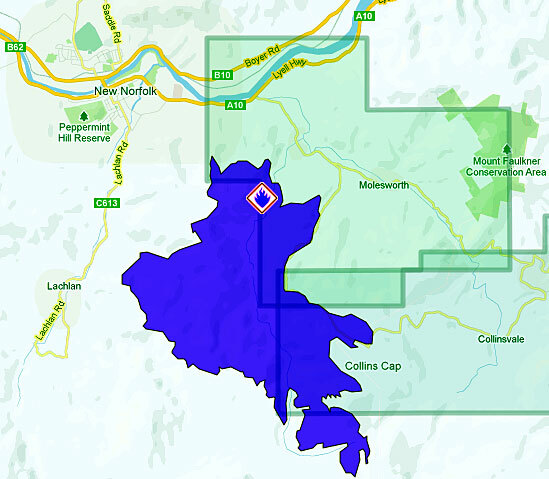 THE Molesworth bushfire remains uncontrolled more than a week since it started on Glen Dhu Rd. The fire danger rating in the area is forecast to be high today. Weather conditions are forecast to be warmer this weekend with increased winds. Patches of vegetation within the fire boundary which have not fully burnt continue to smoulder. These spots may continue to put up smoke for some time but the Tasmania Fire Service says there is no immediate threat to communities. Smoke from this fire may effect the communities of Lachlan, New Norfolk, Molesworth, Collinsvale, the northern suburbs and Mt Wellington due to variable winds. There are no reported road closures at this time but motorists are asked to drive carefully as roads may be affected by smoke in low lying areas. There may also be an increased amount of wildlife near roads. Unless you are a resident or have urgent business, consider avoiding travel in this area. Crews continue to patrol and monitor the fire edge around Ringwood Rd at Lachlan, and Collins Cap Rd and Glen Dhu Rd at Molesworth, and other properties in the area. NSW and TFS remote area firefighters continue to extinguish hotspots in very rugged terrain, with the assistance of machinery and aerial water bombing, in the south-western area around Ringwood Trail and Collins Cap. Stay up-to-date with ABC Local Radio and www.fire.tas.gov.au for further information.